Peterborough Panthers team boss Carl Johnson insisted common sense prevailed last night (June 4) . . . in the end. The city club saw their SGB Championship KO Cup quarter-final trip to Scunthorpe abandoned after just five races. They trailed 19-11 when a downpour flooded parts of the Eddie Wright Raceway circuit. Despite attempts from the home club to restore the track to acceptable condition, the meeting was eventually called off by referee Peter Clarke - and Johnson is adamant that was the right call. He said: “Scunthorpe tried to get the track back into shape, but it was a waste of time to be quite honest. The track was hard and slick in the first place, so the heavy rain left it flooded. “We certainly didn’t want to resume the meeting and the Scunthorpe riders didn’t either. The right decision was reached in the end, but I feel it should have been made an hour earlier. The abandonment cut short new signing Chris Harris’ eagerly awaited Panthers’ debut. Harris, who had seen his first two intended appearances for the club rained off, recorded second places in his two outings at Scunthorpe before the heavens opened. Panthers, who were without regular riders Jack Holder and Bradley Wilson-Dean due to international commitments, hadn’t provided a race-winner. A new date for this fixture is still to be agreed. It is unlikely to take place ahead of Scunthorpe’s visit to the East of England Arena on Friday, June 16 for the other leg. Panthers are next in action on Thursday when they travel to Redcar for a league clash. 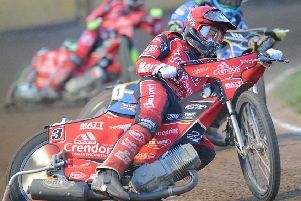 SCUNTHORPE: Lewis Kerr 6, Tero Aarnio 6, Michael Palm Toft 3, Ryan Douglas 2, Carl Wilkinson 1, Nathan Greaves (guest) 1, Rider replacement for Josh Auty. PETERBOROUGH: Chris Harris 4, Paul Starke 2, Simon Lambert 2, Tom Bacon 2, Kyle Newman (guest) 1+1, Ulrich Ostergaard 0, Rider replacement for Jack Holder. * Holder helped Australia to victory in a World Under 21 Team Cup semi-final on Saturday (June 3). He scored 10 points as the men from Down Under beat Great Britain and two teams from host nation Germany at Pocking. Wilson-Dean, the New Zealand champion, is also in Germany to race in a GP qualifier today.